Be adventurous with food! These savory granola bars are super trendy with ancient herbs such as rosemary and thyme, and are tailored for gut-health. 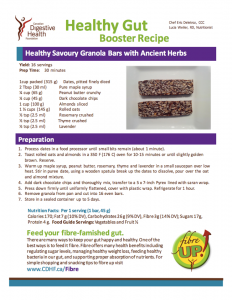 Created with Chef Eric Deletroz this health-booster recipe is high in fibre, easy to make and tastes GREAT! Presented at the 2016 Digestive Health Summit in Toronto to healthcare professionals and consumers these unique on the go bars were a hit and are ready to fill your hunger gap too. Enjoy! Here is my secret tip for tasty make ahead vibrant green veggies. 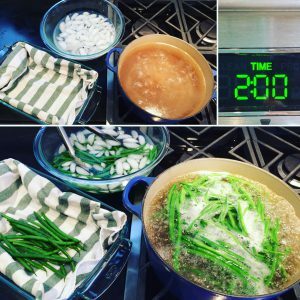 It’s called blanching – where the veggies are placed briefly into boiling water then removed and plunged into an ice bath that stops the cooking. Blanching is a terrific preparation method to partially cook veggies making them a bit softer and removing any strong taste without compromising nutrition. You can serve blanched veggies directly or keep them in the fridge for up to 5 days. Use blanched veggies as salad boosters or reheat for a quick dinner side dish. It’s also a terrific pot luck dinner contribution where you prep ahead at home, store in fridge and upon arrival at the host’s home you only need to reheat briefly for a healthy and tasty side dish. Wash and clean you green veggies. Drop a small batch of veggies into boiling water for 2 min (3 min max. if you must). Repeat steps below until all your veggies are blanched. Take out veggies from boiling water using long handle tongs or slotted spoon & toss them into ice water bath for a few minutes to stop the cooking. Remove cooled veggies from ice bath, shake out water and place them on clean tea towel to dry. Place all your blanched veggies in a covered container and store in the fridge for up to 5 days. Enjoy cold in salads or reheat on stove top in a pan with 1 Tbsp vegetable oil. Top with toasted almonds for a tasty and nutritious side dish. I love making this hardy soup on a weekend afternoon when it can simmer for over an hour. It makes a terrific meal and is great for lunches or a 2nd meal during the week. 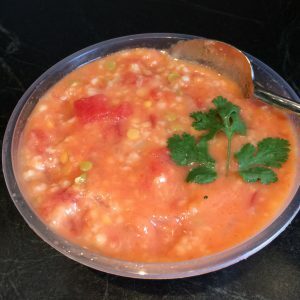 The health boost comes from pulses (split peas), whole grains such as barley and the veggies of course. Enjoy! Garnish with cilantro or parsley and serve. Do you love crunchy salads? Try my nutritious, tasty and easy dish that’s a hit every time. One serving of this salad is a source of fibre, has 6 grams of protein and you get 10% of your recommended daily intake of iron! What’s the secret of this nutrition boost? A little serving of Edamame! Edamame is a green soybean that is harvested when soybeans are still young. It is packed with fiber, protein and has a bit of iron too. 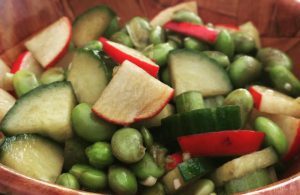 You can find Edamame beans in the frozen food section of your grocery store. Enjoy them warm or cold – as a snack, side dish or in salads. Nutrition Information per serving: Calories 145, Fat 11 g, Carbohydrate 7 g (including Fibre 3.5 g), Protein 6 g.
TIP: Make a double batch and take it for lunch the next day. Smoothies are all the rage and rightly so. It’s a fun and easy way to combine tasty and good for you ingredients. Take this 3 ingredient recipe and make it your own. 2 Tbsp. Protein Boost – (whey powder or skim milk powder). 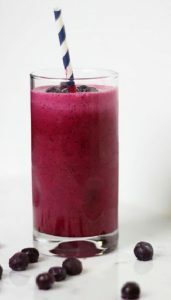 Mix in all ingredients in a blender and enjoy!